We promise that you will always be evaluated by a doctor on your first visit for all medical conditions. During this visit a medical history and physical exam is performed. This visit takes approximately 30 minutes and helps determine if leg imaging is necessary with ultrasound. For patients that have exclusive spider/reticular vein concerns, ultrasound mapping is usually not necessary. Once the doctor decides if an ultrasound of the legs is necessary, we will try and get you in the same day if there is an opening. All of our ultrasounds are performed in our office by a Registered Vascular Technician (RVTs). This is a very simple and painless ultrasound of the legs and it helps us determine which veins in your legs are giving you problems. After your ultrasound is complete, the doctor will meet with you and give you the results of your ultrasound. From there we can determine what is causing your problems and if treatment is recommended. Ultrasounds of the legs can take up to 60 minutes due to the nature of the exam. 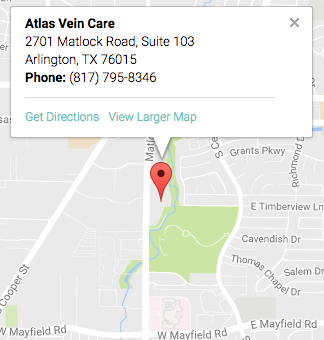 If you are scheduled to have an ultrasound and consultation, expect to be in our office for about 90 minutes. Once your medical exam and ultrasound is complete, Dr. Eidson will discuss with you all findings and personalized treatment options, including possible risks and benefits, and answer any questions you may have. For more information on the different types of treatment plans, please go to our Treatment Options tab on the stop of the website. If required, prior authorization from your insurance company will be obtained before any treatment is performed. We will also call your insurance company and get an updated estimate of your out of pocket expenses. We don't like surprises and we try to do everything in our power to prevent any financial surprises. Prior authorizations from your insurance for your treatment can take 3 days to 6 weeks depending on your insurance carrier. Your recommended/approved treatments are then scheduled. After treatment, we will schedule a 1 week and a 6 week ultrasound after your last treatment. These follow up ultrasounds are extremely important. This helps us ensure that you are getting the best possible results from your treatment. We are ensuring that the veins we treated are closed properly and we are also checking for blood clots and more. It is very important that these 2 ultrasound follow up appointments are not missed. The reason we are firm on these ultrasounds is because if there is something that is not right, we can address it sooner rather than later. Every patient gets a post treatment instructions form to refer back to after treatment. You will also get Dr. Eidson's direct phone number. If you feel like you might have a problem that needs to be addressed immediately, that number is there. We encourage people not to feel bad about calling that number, especially on weekends or at night. If you have a problem, we need to know about it as soon as possible. We want to take care of you and give you the best care you deserve. Recovery time? Most people see improvement of their symptoms in a matter of weeks after their last treatment. You can resume normal activities almost immediately following treatment. We don’t recommend immediate power lifting or marathon running, but how many of us are doing that anyway? You can even drive yourself home after treatment. We will wrap your leg after each treatment so we recommend that you wear loose fitting pants on that day. We would like you to wear these wraps for 24 hours and then replace them with compression socks or reuse the wraps for 5 days following each procedure. Do I need to stop my medications? You do not need to stop any medications including blood thinners and diabetes medication. These medications do not affect treatment at all and should be taken according to your doctor’s recommendation.